Human Drone Flight EHANG 184 which is the pilotless passenger drone created in China clears off to fly over in the US. Soon this drone will fly in Nevada. Ehang 184 is the autonomous aerial vehicle which is safe and best human drone flight. Ehang can able to carry one passenger, and this drone has eight propellers and four arms whole world. Ehang 184 has the 106 kw with the total of 8 motors. This drone flight is capable and attains an average speed of 60 mph. The maximum load capacity of the drone is 100 kgs. The duration of the flight at the sea level is 23 minutes, and it has 14.4 kWh LiPo battery. The suggested flight altitude is 500 meters. It takes 2 hours for the fast charging of the given batteries. This aerial drone flight is designed for air transportation for the people who are moving in short and medium distances. With one click from point to point, the flight makes its journey smarter. The flight has the unique automation system, with one simple click the advanced options, the flight takes off, and landing is made easy. 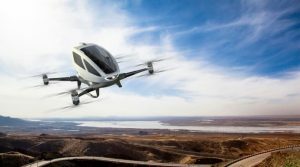 This Chinese Ehang Drone stole the technology show held at CES 2016 in Las Vegas, US. This Drone will go under testing at The Nevada Institute for Autonomous Systems (NIAS), and the approval for this is given by the Governor’s Office of Economic Development (GOED) in the association with the Federal Aviation Authority (FAA). The designer had bad memories after two of his friends were killed in airplane crashes. So he wants to design an ideal safe aerial vehicle. The experience travelled in this drone flight is made very simple. After setting up the light plan with the simple click, the passenger can take off to any location by just assigning the location on the map. Just sit, relax and enjoy the ride in the Ehang 184, it will take care of the rest till you reach the destination.